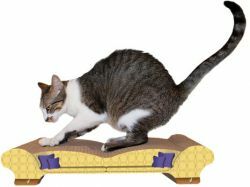 Fed up with the cat scratching your couch? We've got the solution! Featuring a sturdy, honeycomb surface that mimics natural tree bark, the Love Seat Cat Scratcher is built for scratching and snoozing. Made in the USA from recycled paper. Bag of 100% certified organic catnip included. Measures: 9" D x 21.25" W x 4" H. Weighs: 1.7 lbs.